Sometimes, I can speak better through food. I’ve been doing it for years, but only recently have I really realized that it’s another language I’m pretty fluent in. All of the words and emotions I want to tell someone can so easily be channelled into a dish, a treat, a food gift. The happiness I’ve received from serving a meal, surprising someone with a treat or gifting anything from cookies to pickles to lasagna runs so deep. For me, good, nourishing food can do more than a card or regular birthday gift. A friend’s birthday was this past week, and I was thinking on what to get her. As I move in my own life towards more intentional purchases, I’ve tried to apply that to gifts, but I couldn’t think of something I could buy her that would fit or wouldn’t be more of what I had given her in years past. After some thought, I decided to make her a food gift. She and I share a love of vegetarian food (as well as cheese 😉 ), so something besides a dessert sounded like a fun challenge and something she would appreciate. 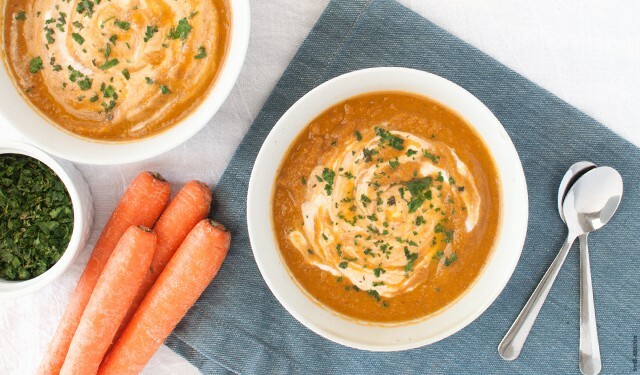 After scrounging around the pantry, a carrot and lentil soup came together in my mind. I’m not entirely sure why soup at the time, but I went with it. It had been cool that week? I just really like making soup? I just went with it. As I was putting this soup together, I started to get a little unsure about this gift. It’s definitely the most unique food gift I’ve ever made and I was hoping she would see a mason jar filled with a pureed soup as exciting as I did. Would a baked good be better? Should I start over? Was this going to get lost in translation? I stuck with my soup, because something told me just to do it and because it was a tasty soup! Roasting the carrots brought out a great flavor and kept it from getting too sweet, something I encounter when I cook the carrots with the broth in vegetable soups. The lentils added some heft to the soup but let the flavor of the carrots shine. I added some chipotle to give the soup a tiny bit of heat, depth and something different. The next day I handed her the soup, still a little nervous. Would she get it? Would she understand what I was saying with birthday soup? “Happy Birthday! I made you some soup!” I said, placing the jar on the table. To my delight (and relief), her eyes lit up. She was so happy and excited about this soup! She got it immediately. I had also forgotten that when she broke her foot a year ago, I made her a different soup as a Feel Better! soup. She didn’t. And in that moment, all the love, good thoughts, and magic of why I give food gifts hit me. Insecurities be damned, when it comes from making good, nourishing food from the heart, I can never go wrong. In a medium pot, combine lentils, 3 cups of water, garlic cloves, and a dash of salt. Bring to a boil, then reduce heat to low and simmer for 15-25 minutes or until tender. Drain lentils and keep the garlic. As the lentils are cooking, arrange carrot logs on a foil-lined baking sheet. Lightly drizzle with olive oil, salt, pepper, and paprika. Roast in oven for 15-20 minutes or until fork tender. 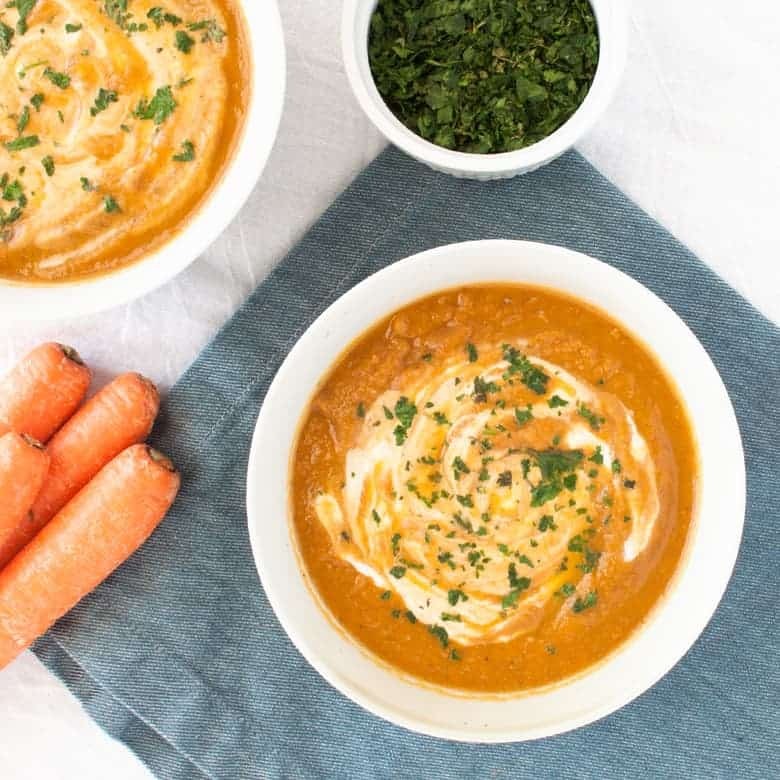 If using a blender to puree, combine lentils, carrots, garlic and stock into blender in batches and blend until smooth and to your preferred consistency. Add or subtract stock for that. Add spices and adjust seasonings to your taste. 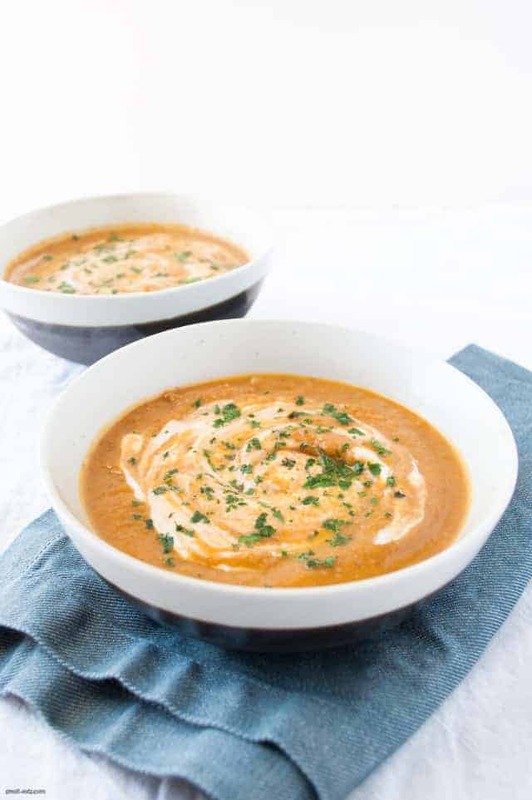 If using an immersion blender, combine lentils, carrots, garlic, stock, and seasonings in a large stock pot and blend until smooth, adding more or less stock to get the consistency you want. Ladle into bowls and add a dollop of full-fat yogurt (preferably organic) and stir in. Top with parsley if desired and serve.